2002-01-08 Assigned to EAGLE-EYE, INC. reassignment EAGLE-EYE, INC. ASSIGNMENT OF ASSIGNORS INTEREST (SEE DOCUMENT FOR DETAILS). Assignors: SULLIVAN, MARK C.
2003-07-24 Assigned to SKYBITZ, INC. reassignment SKYBITZ, INC. CHANGE OF NAME (SEE DOCUMENT FOR DETAILS). Assignors: EAGLE EYE, INC.
2003-08-15 Assigned to INDUSTRIAL TECHNOLOGY VENTURES, L.P., AS COLLATERAL AGENT, AIG HIGHSTAR CAPITAL, L.P. AS COLLATERAL AGENT reassignment INDUSTRIAL TECHNOLOGY VENTURES, L.P., AS COLLATERAL AGENT SECURITY AGREEMENT Assignors: SKYBITZ, INC.
2004-01-22 Assigned to EAGLE EYE, INC. reassignment EAGLE EYE, INC. CHANGE OF NAME (SEE DOCUMENT FOR DETAILS). Assignors: SKYBITZ, INC.
2008-08-26 Assigned to ORIX VENTURE FINANCE LLC reassignment ORIX VENTURE FINANCE LLC SECURITY AGREEMENT Assignors: SKYBITZ, INC.
2012-02-02 Assigned to SILICON VALLEY BANK reassignment SILICON VALLEY BANK SECURITY AGREEMENT Assignors: SKYBITZ, INC.
A geographic tracking system with minimal power and size required at the mobile terminal collects observation data at the mobile terminal, forwards the data to a processor, which calculates the position. The mobile terminal needs only to gather a few milliseconds of observation data, and to relay this observation data to the processor. The range from the satellite (or other airborne transponder) to the terminal is determined using the known positions of an interrogating transmitter and a satellite, and a known terminal delay between the received signal and the transmission of the return signal, and the round trip time. An arc of locations is determined by computing an intersection of a sphere centered at the satellite having a radius given by the calculated range with a model of the Earth's surface. The candidate points are considered and refined using code phase measurements from a set of GPS satellites. The candidate point having the lowest residuals or expected to measured code phases is chosen as the location of the mobile terminal. The measurements can be refined to account for various sources of error including measurement bias, relative motion and timing errors. This application is a continuation-in-part of U.S. patent application Ser. No. 09/351,852, filed Jul. 12, 1999 (now U.S. Pat. No. 6,243,648). Further, this application claims the benefit of U.S. Provisional Application No. 60/243,430, filed Oct. 27, 2000. Each of the preceding applications is incorporated by reference herein in its entirety. These and other objects of the present invention are described in greater detail in the detailed description of the invention, the appended drawings and the attached claims. FIGS. 3(a) and 3(b) depicts a geographical representation of the method of FIG. 2 used to locate a terminal unit according to the present invention. FIG. 5 is a schematic illustration of an exemplary embodiment of a system according to a second embodiment of the present invention. Referring to FIG. 1, an exemplary embodiment of a system [ 10] includes a Service Operations Center (SOC) , which is coupled to a Satellite Gateway (SG) , a communications satellite , satellites in the Global Positioning System (GPS) [14-17], a terminal unit , and a Reference Network (RN) . The terminal unit  receives signals from multiple GPS satellites [14-17], and the communications satellite . The terminal unit [ 18] receives a broadcast message on its forward communications satellite link, which broadcast message contains timing and acquisition aiding information. Following receipt of the message, the terminal unit performs its observation data collection function, and then transmits back to the SOC the observation data, along with any necessary system and/or status information, at a fixed delay from the received broadcast information. All processing of the observation data is done at the SOC . The terminal unit  merely takes measurements and returns the observations as part of the broadcast/response cycle. The SOC [ 11] controls the operation of the system  of the present invention. The SOC  broadcasts a signal on the forward link which contains timing and acquisition aiding information that can be received and used by the mobile terminals to synchronize time and to rapidly acquire their intended GPS signals, from which they take their observation data set. The forward broadcast can also contain command and control protocols for individual and/or groups of terminals. The return signal from the terminal [ 18] includes the observation data along with any system, status or protocol information necessary to operate the system. The return signal is synchronized to the forward signal by a specific and known delay, which allows the Satellite Gateway [ 12] to take an additional measurement of the round-trip signal propagation time and absolute Time-of-Arrival (TOA). The Satellite Gateway [ 12] consists of satellite communications modems (channel units) and associated control and management equipment and software. The gateway maintains an accurate time and frequency reference for control of the forward link broadcast, and for propagation time measurements. The terminal needs only to accurately respond relative to the forward signal and therefore can use a much less accurate, and low power, internal reference. The satellite gateway  is a traditional satellite communications facility. Therefore it also includes antenna, transmitter, amplifier, up/down conversion, and other standard satellite communications equipment and software that is not shown, but is known to those of skill in this art. The present invention only requires that the mobile terminal [ 18] receive a signal, make observations (measuring certain aspects of the GPS signals), and return another signal, which includes the observation data, and can be accomplished over a very short interval. There are various types of observation data that can be relayed to the central site to enable the central site to determine the position of the mobile terminal. Referring to FIG. 2, at time to, a Satellite Gateway (SG) [ 12] transmits a forward signal, with a marker event, through a communications satellite  to a region of the Earth bounded by the satellite beam pattern as in FIG. 3. An example of a marker event is a synchronization data pattern in the packet preamble. The satellite [ 13] receives the signal at time t1, and retransmits the signal back to earth at time t2. Subsequently, at time t3 the mobile terminal  receives the signal with the marker event. When the mobile terminal [ 18] needs to report its position, it searches for the SG signal in the satellite downlink. This signal contains information to aid acquisition (e.g., a prioritized list of GPS satellite vehicles in view over the coverage region, Doppler offset information, timing reference, etc.). Satellite vehicles in the list are prioritized to allow the mobile terminal  to search for and select those satellites that provide a favorable observation set of GPS satellites (i.e., to minimize dilution of precision, exclude degraded or non-operational satellites, etc.). The SG  also synchronizes the outbound transmission relative to a GPS timing reference. Using the acquisition information recovered from the forward message, the mobile terminal [ 18] receives a multitude of GPS signals starting at time tobs, which is a fixed and known time interval from t3. The operation of the receiver is synchronized with the signal received from the SG . In turn, the signal received from the SG  is synchronized to GPS time (such as the X1 epoch). Consequently, the receiver clock offset associated with the GPS spreading codes used to recover the signals can be estimated back at the ground station with reasonable (less than +/−0.5 milliseconds) accuracy. The terminal [ 18] measures the Code Phase of Arrival (COA) of each of the GPS signals at tobs. The terminal  then relays this measurement to the SG  by transmitting a return signal back through the communications satellite at time t4, which also has a fixed and known relationship to the inbound timing reference t3. The communications satellite [ 13] receives the return signal from the mobile 2 terminal at time t5 and retransmits the same signal back to the SG  (or another ground station) at time t6. The return signal is received by the SG at time t7 and compared to the forward link timing reference and a round-trip propagation time measurement is taken. Absolute Time of Arrival (TOA) measurements are also taken. The SG  recovers the contents of the return transmission and forwards the 30 data along with its propagation time and TOA measurements to the SOC . The SOC [ 11] calculates the magnitude of the range vector between the communications satellite  and the terminal  by removing all known delays from the propagation time measurement. This is accomplished using the communications satellite position, velocity and transponder group delay information, the Satellite Gateway antenna position, known signal delays in the ground cable/equipment path, and if desired, any atmospheric or other transmission path delays that can be modeled. These delays and the relationships between the times are depicted in FIG. 2. This range calculation is fairly standard and common practice in the satellite communications field, and would be known to those of skill in the art. After the range between the communications satellite [ 13] and the terminal  is determined, the SOC  determines an arc of possible locations. This is determined by computing an intersection curve 31 (see FIG. 3) of a sphere, centered at the communications satellite having a radius given by the calculated range from the satellite  to the terminal , with a model of the surface of the Earth. The spacing of points on the parameterized intersection curve depends on spacing of chosen points φ and the earth model chosen and is depicted in FIG. 3( b). The choice of parametrization method need only guarantee that at least one of the initial points will fall within the convergence zone around the true solution. As used herein, convergence zone refers to the area around the location of the mobile terminal in which a point must lie to guarantee that the position calculation will converge to that location. The size of the convergence zone will vary depending on number, quality and type of observation data used, but as an example, the convergence zone for the code phase observations is approximately a radius of 75-80 Km (See FIG. 3(b)). Only that portion of the arc within the region of the Earth bounded by the satellite beam pattern is retained by the SOC. Refer to FIG. 3( a), which depicts the bounding of the arc (or parameterized intersection curve) by the beam pattern. The SOC next determines the time that the mobile terminal collected the GPS signal (t obs). The collection time is determined from the range between the satellite and the terminal and SG. The known delays in the transmission paths (i.e., transponder group delay, atmosphere, etc. ), the terminal collection method (i.e., fixed delay from t3 and integration period), and the absolute TOA measurement. The SOC then employs a satellite orbit model to estimate the positions of the GPS satellites at their time of transmission (t xmt). GPS txmt is calculated from tobs less the GPS signal transit time (user must also correct for earth rotation during signal transit time if working in Earth fixed coordinates). known tolerance of this range estimate then it is discarded. possible relative to this earth model then it is discarded. candidate solution lies outside the beam boundary it is discarded. other screening criteria) to screen false candidates. the calculation exceeds the threshold are discarded. FIG. 4 depicts the above calculations performed by a processor in the SOC [ 11] in flow chart form, which is suitable for implementing in software for execution on a general purpose computer. Upon receipt of the information packet at the SOC  containing the observation data from the terminal  and the measurement and ancillary data from the SG , the SOC processor obtains the latest state vector for the communication satellite , and the ephemeris, clock and atmospheric data for the GPS satellites [14-17]. The SOC [ 11] then performs a series of calculations as shown in the flow diagram resulting in several candidate position solutions. The candidate solutions are then screened per the criteria described previously, and another iteration is performed which can include the atmospheric correction data. If there is more than one remaining solution then a final screen and selection takes place. The final position obtained can then be converted to the desired coordinate system. FIG. 5 illustrates a communication system according a second embodiment of the present invention. A communication satellite  502 transmits a forward control packet to a mobile terminal 504. Typically, the forward control packet includes information regarding the time slot in which the mobile terminal can send an access request to communication satellite 502. Mobile terminal 504 receives the forward control packet and synchronizes to it. At the appropriate time, mobile terminal 504 transmits an access request to communication satellite 502. Communication satellite 502 receives the access request and measures the timing of the received access request with respect to the forward control packet's timing. The measured timing is compared to an internal reference. Based on this comparison, timing correction information is generated. The timing correction information is used to adjust data transmission timing of mobile terminal 504 so that data packets it sends are received by communication satellite 502 properly aligned in the appropriate time slot of the reverse channel. Communication satellite 502 transmits a response message to mobile terminal 504 containing the timing correction information. Mobile terminal 504 receives the response containing the timing correction information. Using the timing correction information, mobile terminal adjusts its transmitter timing. This adjustment is to advance, delay or maintain the transmitter's timing. Mobile terminal 504 then sends the GPS code phase data and the timing correction information to communication satellite 502 to be sent to a ground station 506. Ground station 506 receives the GPS code phase information and the timing correction information. Ground station 506 then relays this information to a service operation center (described above), where it is used to determine position of the mobile terminal. Alternately, ground station 506 can initiate the transmission of the forward control packet, receive the access request, compare it to an internal reference and determine the timing correction information. The timing correction information is a measure of the propagation delay from the mobile terminal to the communication satellite. A range arc (described above) is determined using the propagation delay. The range arc has communication satellite  502 at its origin. Determination of the range arc using the propagation delay between mobile terminal 504 and communication satellite 502 is well known to those skilled in the art. This range arc is used to determine position as described above. Consequently, the range arc determined from the propagation delay corresponding to the timing correction information determined as part of the communication satellite's protocol is used as an input to the range ambiguity resolution technique described above. Mobile terminal  504 can alternatively be programmed to send the timing correction information along with GPS code phase measurements to the SOC. The SOC uses this information to determine the mobile terminal's position. Modifying mobile terminal 504 to send this data to the SOC eliminates the need to modify or augment existing ground station equipment to provide these timing measurements directly to the service operations center. a SOC to which the mobile terminal sends a message containing the timing correction information and the signal characteristic for each of the received signals, the SOC determining a range arc with the communication satellite at its origin using the timing correction information, the SOC determining possible locations of the mobile terminal on or near where the range the range arc intersects a surface of the Earth and using the signal characteristic to refine the possible locations and determine a final position of the mobile terminal. 2. The system recited in claim 1, wherein the final position is determined by analyzing one or more of residuals, altitude and proximity to a beam boundary of the communication satellite. 3. The system recited in claim 1, wherein the signal characteristic is a code phase measurement. 4. The system recited in claim 1, wherein the signal characteristic is Doppler. 5. The system recited in claim 1, wherein the signal characteristic is bit phase information. 6. The system recited in claim 1, wherein the signal characteristic is carrier phase. determining the position of the mobile terminal using the timing correction information and measured signal characteristics. determining the position of the mobile terminal using the range arc. 9. The method recited in claim 7, further comprising the step of sending the timing correction information and measured signal characteristics to a satellite operations center through a gateway. 10. The method recited in claim 7, further comprising the step of sending the timing correction information and measured signal characteristics directly to a satellite operations center. 11. The method recited in claim 7, wherein the measured signal characteristic is code phase. 12. The method recited in claim 7, wherein the measured signal characteristic is Doppler. 13. The method recited in claim 7, wherein the measured signal characteristic is bit phase. 14. 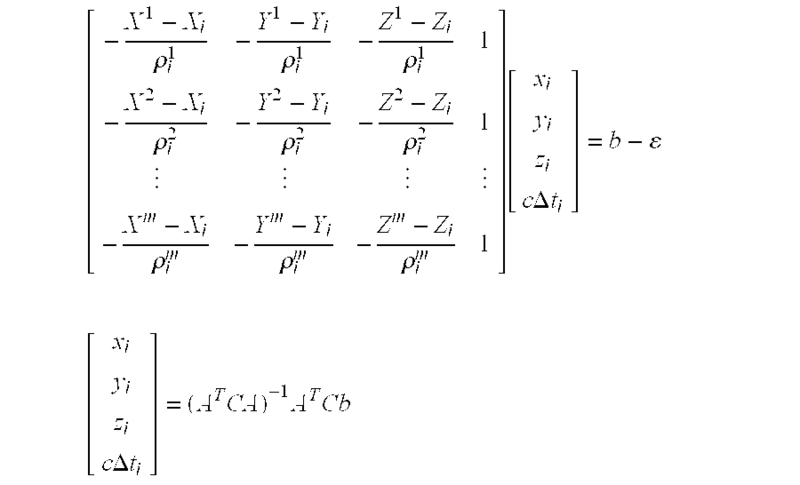 The method recited in claim 7, wherein the measured signal characteristic is carrier phase. means for determining the position of the mobile terminal using the timing correction information and measured signal characteristics. means for determining the position of the mobile terminal using the range arc. 17. The system recited in claim 15, further comprising means for sending the timing correction information and measured signal characteristics to a satellite operations center through a gateway. 18. The system recited in claim 15, further comprising means for sending the timing correction information and measured signal characteristics directly to a satellite operations center. 19. The system recited in claim 15, wherein the measured signal characteristic is code phase. 20. The system recited in claim 15, wherein the measured signal characteristic is Doppler. FR2712095B1 (en) * 1993-11-05 1995-12-22 Europ Agence Spatiale A method of aerial or satellite altimetry, in particular for altimetry oceans and Óoeuvre device using such a method.